The ECOSAFIMED project of the ENPI CBC MED programme, co-ordinated by the Biodiversity Foundation of the Ministry of Agriculture, Food and Environment, promotes responsible practices in artisanal fisheries and the conservation of benthic ecosystems in the Mediterranean basin. The Marine Science Institute of Spain’s Scientific Research Council, the National Institute of Marine Sciences and Technologies of Tunisia and the University of Genoa from Italy completed the field surveys as planned and met to discuss current state and the progress of the project. Spain, Italy and Tunisia convened in Gammarth to hold the 4th Steering Committee meeting for the ECOSAFIMED project of the ENPI CBC "Mediterranean Sea Basin" Programme. Representatives from all the partners as well as from the Directorate-General of Fisheries and Aquaculture of the Ministry of Agriculture of Tunisia, the National Contact Point of the European Commission in Tunisia and the National Agency for the Promotion of Research attended the meeting. After nearly 18 months of project implementation, this meeting aimed to assess the progress and to define the next steps to follow. In this regard, partners paid special attention to the analysis of the previously collected data during the 6 oceanographic surveys and more than 50 days of fishing operation, which were the main activities carried out during the last months. They also exchanged views on the definition of the common final variables to evaluate the impact of artisanal fishing gears on benthic communities in the study areas. In addition, during the steering committee meeting, both the Tunisian and Italian partners reported their own experience regarding the informative sessions with fisheries stakeholders. These informative sessions took place in Ponza and Patti in Italy, and in the ports of Kelibia, Tabarka and Bizerte in Tunisia. Attendance rose up to about 150 participants. In May, the Spanish partner will also hold informative sessions with local fishermen in Ciutadella, Mahon, Fornells, Alcudia and Cadaques. All the partners made proposals on how to continue involving fishermen in order to improve their practices in artisanal fisheries. To conclude, project partners planned the following steps to be achieved within the framework of the project, further focusing on data analysis, guidelines drafting and informative activities as a key point to transmit the knowledge gained among both sides of the Mediterranean basin together with public institutions, fishermen and general public. Furthermore, apart from organising a congress by the end of 2015, it is also foreseen to issue an informational video within the framework of the project as well as a technical publication. With a budget of €1.9 million, the ECOSAFIMED project promotes responsible fishing practices and communication between researchers and the artisanal fishing sector, with the aim of helping to conserve marine ecosystems. The ultimate objective of the project is to produce a series of recommendations for managing the artisanal fisheries studied in the Mediterranean, to ensure their compatibility with good conservation practices for marine habitats. The project also seeks to identify valuable areas to be proposed as Protected Marine Areas under the auspices of European Directives and/or the Barcelona Convention. ECOSAFIMED is one of the 39 projects to have received funding from the 1,095 projects presented at the second call for the 2007-2013 ENPI CBC MED Programme. The ENPI Mediterranean Sea Programme is a cross-border co-operation initiative that forms part of the European Neighbourhood and Partnership Instrument (ENPI). The programme’s aim is to promote co-operation between regions on both shores of the Mediterranean, in order to tackle common challenges and assess endogenous potentials. A total of 14 countries, representing 76 regions and close to 110 million inhabitants, have benefited from the programme: Cyprus, Egypt, France, Greece, Israel, Italy, Jordan, Lebanon, Malta, the Palestinian Authority, Portugal, Spain, Syria and Tunisia. The programme has a budget of €200 million, funded by the European Neighbourhood and Partnership Instrument, and the contribution to each project amounts to a maximum of 90 per cent of the total cost. 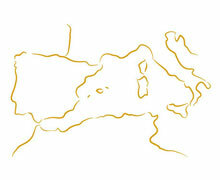 The projects funded deal with a range of issues relating to promoting socioeconomic and territorial development: supporting innovation and research; sustainable development and energy efficiency throughout the Mediterranean Sea Basin; improving conditions and the various forms of movement of persons, goods and capital; and promoting dialogue between cultures and forms of governance. Information on the ECOSAFIMED project and the ENPI CBC MED Programme is available on the ENPI CBC MED and the EuropeAid Office of Development and Cooperation websites. This publication was produced with financial support from the European Union, in the framework of the ENPI CBC Mediterranean Sea Basin Programme. The contents of this document are the sole responsibility of the Biodiversity Foundation and do not under any circumstance reflect the position of the European Union or the Programme’s management structures.